Health risks of wearing the wrong bra during horse riding. Attend any equestrian event around the country or look around at equestrian groups and riding schools and it is clear that most horse riders are female. Add to this that horse riding is a sport with quite a lot of ‘bounce’ as it is considered to be a high impact sport, in the same category as running, mountain biking and high impact aerobics and you have a potential for long term health issues. Female horse riders are at risk of irreparable damage every time they get in the saddle, even when they never fall of a horse and without being in any accident. Riding without the proper chest support may contribute to pain and discomfort, and stretched skin and ligaments, which may lead to droopy, saggy breasts. Breast tissue stretches, and the more bounce during riding the more the tissue stretches without being able to recover. So unless you like saggy breasts, it may be worth your while to invest in a good equestrian sports bra. In addition to the physical long term effects of wearing the wrong bra while riding, it is also very distracting. While you ride you don’t want to be thinking about your painful breasts, or jeopardizing your posture trying to support your breasts with your arms while riding as this will inhibit your ability to rider properly and safely. How choose the right equestrian sports bra? The equestrian sports bra needs to support you while riding, especially while you’re trotting or cantering as these paces create a lot of vertical movement (or ‘bounce’) which require the additional support. The equestrian sports bra often has molded cups. The molded cup makes it appear more stiff which helps with the vertical support. 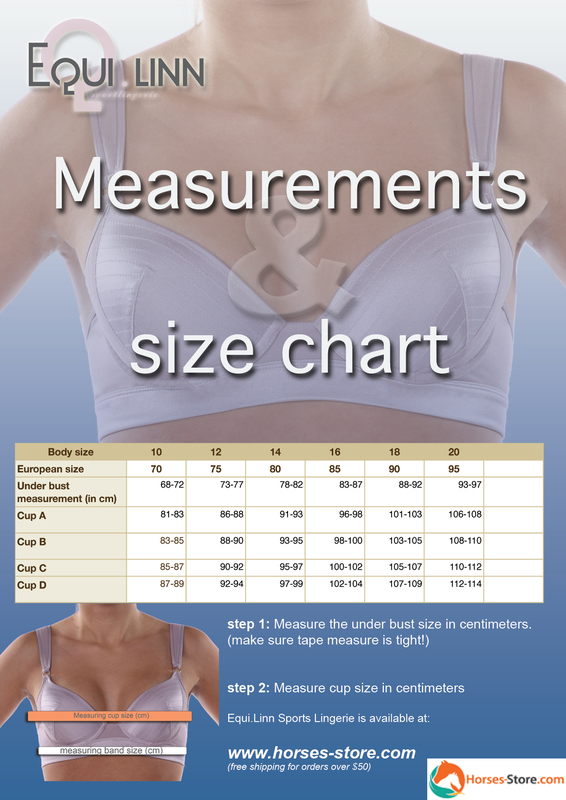 Ideally you choose a size that is true to your real cup size rather than S-M-L. The weight of the breasts is not only carried by the bra straps, but also by the underbust band. It is important to measure properly and not have a band width that is too large.The back band should be very snug so that you can only pull it a tiny way away from your body. When your bra fits properly the back band should be horizontal all the way around and there should be no wrinkling at all on the bust. If your bra is too loose your bust will still move. Make sure that the bra straps are broad so they don’t dig into the muscles on your shoulders. Ideally the bra has the option to be converted into a racerback model as this takes all pressure away from the shoulders. This gives you the best range of motion without blocking or restricting the muscle movement. When to replace a sports bra? Women who wear a sports bra 3-4 times per week usually needs to replace their sports bra within 6 to 12 months. Your bra can last 12+ months when you hand wash your bra after every couple of wears. However, when you wash your sports bra in the washing machine and tumble dry it, it will break the fibers which reduces the elasticity making it necessary to replace the bra sooner as you won’t get the support you need. Why do girls and women choose to ride without a sports bra? Even though instinctively women know the benefits of wearing a sports bra, many women choose not to wear one. These women simply wear their normal bra or no bra at all. What would be the reason behind this choice? Many of the sports bras on the market are very restrictive and/or quite unattractive. This introduces a barrier for women to wear a sports bra during horse riding activities. Especially the age group of 16 - 36 year old riders would rather choose fashion over the benefits of a properly fitted sports bra. The Equi.Linn range of sports lingerie is unique as it combines the benefits of a purposely made equestrian sports bra with the looks of modern lingerie. The materials used are chosen for their supportive and moisture wicking properties. This truly brings the equestrian sports bra to a higher level into sports lingerie. No more reasons to put your health in danger because of the need to be fashionable... every female rider can now look good and be protected at the same time. It has true cup sizes to offer the best possible support and comfort levels needed.